It’d be a glaring omission to recall best Los Angeles meals of 2012 on Eater LA and not give my mentions a proper write-up, and so here is an account of my experience at the bespoke Salon at Heirloom LA. I say bespoke because the act of stumbling into Heirloom was shockingly not via their famously flavor-packed, personal sized lasagna cupcakes found at farmer’s markets around town, but instead by luck of an invitation to a private dinner showcasing Bridlewood Wines in that said tasting room. Fortunately, they’ll be opening it up to the public a few days during the week, and I imagine the Eagle Rock community will meet that unveiling with elation. So bring on 2013, then. A winemaker party beginning with an impressive cheese selection is one that begins right, as was the case (Point Reyes Bleu, you complete me). But follow that up with Winter Gourd Soup with a mishmash of crab, crab apples from their own backyard, fried rosemary and shaved sea salt – paired with their 2010 Pinot Noir from Santa Barbara County, and the rainy day meal is masterfully underway. Next was incredibly flavorful Handcut Chitarra Pasta peppered with crumbled fennel sausage, garden thyme, black preserved truffle and parmesan reggiano over a smear of cauliflower ash (who said there weren’t any vegetables in this dinner?). 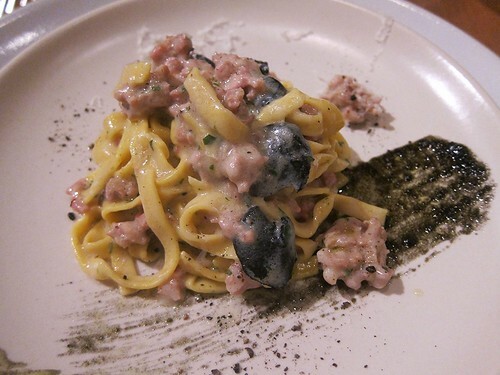 I loved how the bite of the preserved truffle went so well with the fresh made, al dente pasta, complementing both texture and taste. 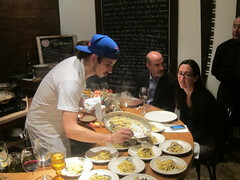 Paired with Bridlewood’s signature Blend 175, the pasta dish was a home run. If their notoriety for lasagna cupcakes weren’t already indicative, Heirloom surely excels when it comes to pasta. Or so I thought. 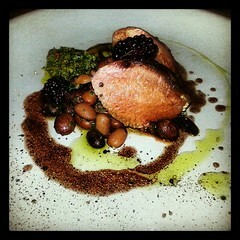 The ultra tender Smoked Lamb Loin had this intense yet balanced flavor – it was heavenly. The delicious bean ragout rounded out its smoke with French tarragon and the blackberry demi-glaze added just the right amount of sweetness. It was the best lamb dish of the year paired with Bridlewood’s 2010 Cabernet Sauvignon – a full wine to hold its own against the bold flavors of the food. The last course was, of course, the sweets to top it all off. Here, we had Chocolate Ganache Cake with salted caramel, cocoa nibs and whipped cream. It was dense and it was rich; it oozed and delighted. So you can mark down Heirloom LA’s Salon public opening as one of the things to watch for this year. Until then, order a batch of their lasagna cupcakes by chefs Matthew Poley and Tara Maxey. They’re not cheap but with all the varieties and flavor packed in each one, they’re worth it – especially for special occasions. Or go to Silver Lake Wine for a Monday wine tasting, at which the Heirloom LA food truck is usually parked outside. And I’ll be bookmarking Bridlewood Winery’s tasting room as a stop on my next trip to Santa Barbara. No matter how clichéd pop-ups have become, there are some quality ones that will surprise you. Thankfully in this case, the cream rises to the top. See you in Silver Lake, Eagle Rock and beyond! Salon currently available for private parties. Opening to public a few days per week soon. This entry was posted in eagle rock, Food, Food truck, Pairings, Silver Lake, wine and tagged Bridlewood Wine, catering, eagle rock, Heirloom LA, lasagna cupcake, Matthew Poley, pairings, pop-up, salon, Santa Barbara County, Silver Lake Wine, Tara Maxey, wine. Bookmark the permalink.